Photo by Charles Barrett, courtesy Marilyn Mapes Barrett. 1977. The Arthur F. Mapes Memorial Literary Scholarship is awarded each year to a senior at East Noble High School in Kendallville, Indiana. 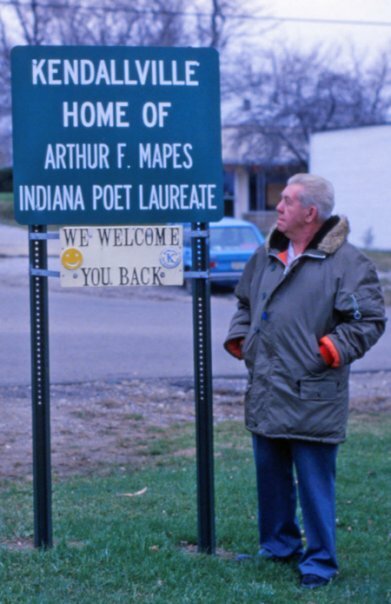 The scholarship honors the memory of Mr. Mapes, Indiana poet laureate and author of the official state poem. Preference for the scholarship is given to students wishing to continue their education in the fields of English and/or literature. The fund began with memorial contributions after the death of Mr. Mapes in 1986. Since then, the scholarship has been funded by sales of his poetry, personal contributions from generous donors, and fundraising efforts of the Mapes family and friends. Fundraisers have included hot dog wagon sales in Kendallville and homemade vegetable soup sales at the annual Apple Festival of Kendallville. Since 2008, the fund has been managed by the Noble County Community Foundation. To learn about the foundation, visit www.noblecounty.org. We’d love to hear what former scholarship recipients are doing now! Please send your stories to angelamapes@hotmail.com.